Big Hugs for Valentine’s Day & You too! Valentine’s Day gets a bad rap a lot of the times. I get it – why do we need a day to remind the people we love that we love them? Shouldn’t we be doing that every day? Yes, we should and we don’t need to spend money on stupid cards, flowers or crappy candy (good chocolate is the exception) to show our love and gratitude for the people we love in our lives. On this Valentine’s Day I think the focus should be on Celebrating Love. Celebrate love by showing your love for everything. Not just the people in your life but the wonderful life you have. Celebrate this amazing world around you and all the blessings that are in your life. You do not need to do this with gifts, instead do it with actions, get out in nature and do something you love with your loved ones, explore and discover new things. If you want to give gifts, make something special, bake a cake, create art together and share it. But make sure it comes from the heart, not just something you have to do because it’s the day we’re suppose to do it. I also think this is a great time to show love for yourself. Whether or not you have a significant other to celebrate with or a family to share your love with, this Valentine’s Day, I think everyone should take a few minutes (or longer) to give yourself the love you deserve. Don’t wait for someone else to buy you a massage, get one for yourself. If you want some decadent chocolate – go get it. If you need a nap, a moment of silence or time to yourself in a nice hot bath – take that time without guilt (easier said than done, I know). 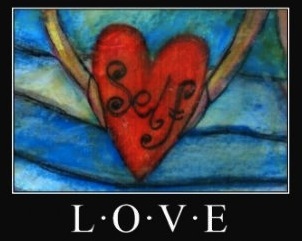 I have talked about this in the past about how challenging it is for so many to have loving compassion for our selves. We spend so much time caring for others, working hard for others and trying to improve ourselves so we can fit in to the stereotypical norms of society we lose track of who we are and what we REALLY need to be fulfilled. For a lot of people, being with friends and family is what fulfills them, but what happens when the security of others is not around? Are you able to sit and be okay alone? This should be the goal for Valentine’s Day – before you shower your loved ones with gifts and love – remember to give yourself a little love and compassion first. This gift will be even more meaningful to your loved ones, because once you can truly love yourself and be happy with what you have, then you can share that love with others around you. This is something I am personally working on and I have a consistent mantra that I try to remember on a daily basis. The word is Maitri (or metta) and it is a Sanskrit word for Loving Compassion. This is a meditation that is helpful to practice when trying to cultivate more love for yourself (and others), I practiced something similar to this in a yoga class this week, which I felt was very fitting for Valentine’s week. The goal now is to try and keep it going after the hearts and flowers have moved on! This entry was posted in Family and tagged family, love, Loving Compassion, Loving yourself, Maitri, Maitri Meditation, Metta, Self Love, Valentine's Day by kathygorohoff. Bookmark the permalink.